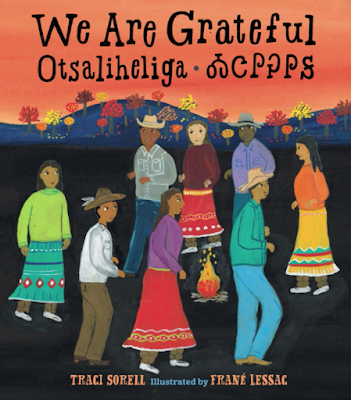 On January 18, All the Wonders did the cover reveal for Traci Sorell's We Are Grateful: Otsaliheliga. People who think of Indigenous peoples as "vanished" or no longer "real Indians" if we aren't walking around in feathers and beads may not know just how wrong they are! That idea is silly! Of course we're still here--and let's be real: those stereotypical ideas are harmful to everyone. We Are Grateful: Otsaliheliga, written by Traci Sorell and illustrated by Frané Lessac will be out in September, from Charlesbridge. Head over to All the Wonders to read the author and illustrator interviews, and... order the book! Eds. 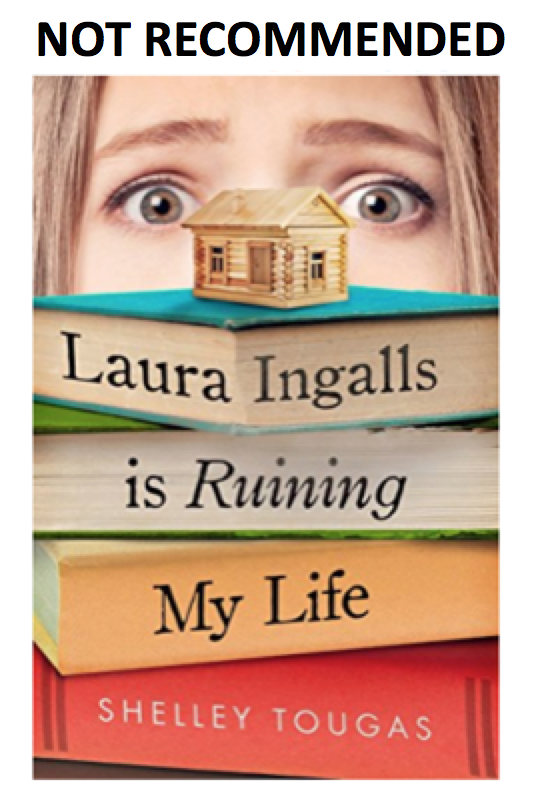 note: AICL is pleased to publish Allie Jane Bruce's review of Laura Ingalls Is Ruining My Life, by Shelley Tougas. It was published in 2017 by Roaring Book Press (Macmillan). To read the introduction to this review, go to Allie's post at Reading While White. 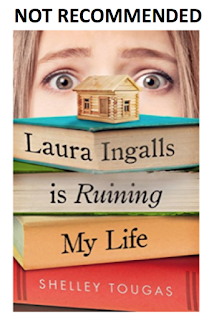 Laura Ingalls Is Ruining My Life, by Shelley Tougas. Reviewed by Allie Jane Bruce. NB - I read, and used page numbers from, a galley of this book. There were twenty-four students in our new class, including Julia [their landlady’s granddaughter], Freddy [her twin brother], and me. Six were Asian. Julia was the only Hispanic student, as far as I could tell. Everyone else was white. I tried to imagine myself as a Native kid reading this passage, or to take it a step further, as a White-presenting Native kid in Charlotte’s class. How would this talk about not reading the books, and not being aware of how Laura Ingalls shaped their town, as “saddening” and “heartbreaking” land with me? Reading it with this mindset, it made me angry. Native people were subject to genocide and forced relocation because of the invasion of people like Laura Ingalls; but what’s really heartbreaking is if someone hasn’t read or appreciated her books? Charlotte finds the assignment annoying, but not problematic. She writes an essay titled “Laura Ingalls Is Ruining My Life” and describes how angry she is that her flighty mother moved them to the town of Walnut Grove to chase Laura’s creative energy. And Ma, who is the sweetest character in the book, hates Indians, and I mean hates hates hates them. Maybe it was because the Ingalls built their cabin on Indian land, and the Indians weren’t too happy about it. In the end, both the Indians and the Ingalls pack up their stuff and move. The Indians are forced to leave their hunting grounds, and the Ingalls end up on the banks of Plum Creek near Walnut Grove, because all Pa wants to do is move. Charlotte offers all of this without editorializing or offering her opinion on Ma’s opinions, which I found strange, since Charlotte offers her opinion on everything, especially if she finds it annoying. Are we to conclude that Charlotte doesn’t find Ma’s bigotry annoying? At best, she is dispassionate about it. ...twins who sneak aboard this space shuttle that’s going to colonize Mars... Mom says it’s the same story because it’s about exploration and pioneers. So we’re still here for Laura. She still needs Laura’s spirit. This is interesting, because I’ve seen outer space exploration and aliens used as metaphors for colonialism and invasion before, in books like The Knife of Never Letting Go, Landscape With Invisible Hand, and The True Meaning of Smekday. I have mixed feelings about them. I appreciate the emphasis on interrogating invaders; and, I think it’s problematic to draw a parallel between aliens and Native humans, or to cast Native and non-Native people as equal parties in any story about colonization. I think Mom’s idea for a Mars book, which rests on an analogy in which White pioneers are to humans as Native people are to literal Martians, is deeply problematic. Over the course of Laura Ingalls Is Ruining My Life, Charlotte and others question whether the Mars book is a good idea, but not for the reasons I state above. The essay, “Manifest Destiny and America’s Expansion,” was long and boring. If you’ve heard people say something is as boring as watching paint dry, well, the Manifest Destiny essay would bore the paint. [...] The essay went like this: After colonists won independence from England, American leaders thought it was destiny for our country to grow. If ordinary Americans could own land, not just rich people, then they would be committed to making the country strong and the best in the word. So the government bought land around Louisiana from France and fought with Mexico to get even more land. And pretty soon the country stretched “from sea to shining sea,” just like the song “America the Beautiful” said. Charlotte’s only problem with the essay is that she found it boring. I like this exchange, although I wonder why we haven’t heard more of Charlotte’s inner thoughts about this--she seems to be reevaluating her initial take on Manifest Destiny. Having learned that one outcome of the U.S.-Dakota war was the largest mass execution in U.S. history, I am troubled by this “fair and balanced” account. I cringe at several things here--casually describing Hmong people as “like Vietnamese, but not exactly” (how would that land with a Hmong child reading it? ), “random” (in the large picture, Hmong people living in Walnut Grove isn’t any more “random” than Charlotte, or any White people, living in Walnut Grove, but this casts them as “other” and somehow different). As for “a new group of settlers came to the prairie” -- to equate Westward invasion and Manifest Destiny with the experiences of immigrants of color living in a White-dominated society is simply inaccurate, and troubling, in that it ignores the power dynamic Hmong people face and erases the fact that White people invaded Native lands (if White people invading the West were “immigrants” the way that Hmong people are immigrants in this context, Native people would have no legitimate grievances). There’s an argument, of course, that Julia is twelve years old and doesn’t understand these dynamics; I do not, however, get the sense that Tougas recognizes the problems with what Julia says (at least, she does not recognize them in the text) or is presenting this conversation as a teachable moment, as she never counters Julia’s ideas. On the contrary, I get a strong feeling that we as readers are supposed to be learning and taking in what Julia says here. I would so, so have loved to see this line of thought extended. Proposing the word “invaders” instead of “settlers” is a big deal, and an important conversation. Alas, this language is never revisited; Charlotte and Julia encounter some mean boys, and further solidify their friendship. Charlotte doesn’t comment on the settlers/invaders question, internally or overtly. This scene factors into my conclusion that Laura Ingalls Is Ruining My Life evolves, rather than interrupts, racism. More on that later. The Trail of Tears essay, which Mrs. Newman assigned to Charlotte on page 126, is next referenced, briefly, on page 169, when Charlotte asks Rose if she’s seen the essay (Rose took it to read it). On page 173, Charlotte and Mrs. Newman have a brief conversation about it; Mrs. Newman brings it up again on page 226. Charlotte still hasn’t read it. Everyone in Walnut Grove was proud of the town’s history. When they drove by the museum and saw those ugly words, they’d feel angry and sad. I paused at this. Are spray painted words on the side of the Ingalls museum uglier than the existence of a museum glorifying participants in Manifest Destiny? This is never followed up on. Mom never accounts for why, if she knew all along that Westward Invasion "stunk" for Native people, she felt comfortable talking in a "dreamy" voice about the "romance" and "pride" of "conquering" the "Wild West". I conclude from this that Mom values Native lives less than she values the romantic story she tells herself about American history. I wondered if Tougas ever considered having Charlotte ask something like, "Well, if you knew, why did you say what you just said?" and I wonder what Mom would reply. "Because I weighed the injustice of the atrocity of Westward Invasion against the mental discomfort it would cause me to let go of my romantic vision of history and decided to prioritize my gooey feelings," perhaps? Or maybe a simple, "Because I know, but I just don't care that much about Native people." At that point, Mom dabbed the oil behind her ears. “If you’re glad, then you don’t know what I mean,” Rose said. “No. I think it’s ridiculous,” I said. I love what Rose says. Of all the characters in the book, she’s the one who interests me most, because what she learns about Manifest Destiny, the Transcontinental Railroad, and the Trail of Tears is real for her. She has, at this point, learned that a societal sickness leads to dehumanizing Native people, and to a museum celebrating Manifest Destiny--and upon learning this, she actively changes. Early in the book, Rose is downright tickled to be living in Walnut Grove, and wants to be Laura in the annual town play (p. 94). Upon learning that her prior version of reality is wrong, Rose changes her mindset and her behavior. Is she right to spray paint the museum? Of course not, but that act of vandalism is trivial compared to the larger systemic and cultural problems with which she is grappling. Unfortunately, Charlotte’s reactions, and the ultimate note on which the book finishes, undo much of the good work Rose does in these few pages (and make me wonder if it’s possible for an author to write a character--Rose, in this case--who understands the world better than the author does). My heart sank when I read this. My hopes were up so high, after Rose’s awakening, and then… sigh. The effect of this passage--especially after Rose’s speech--is to recenter and re-prioritize Whiteness at the expense of Native people. Let’s unpack. Charlotte says the Trail of Tears is “sad… which is why the word tears is in it.” It’s supposed to be funny, a moment of lightness and humor. Four thousand people died on the Trail of Tears. Charlotte, and Tougas, trivialize their deaths in this passage. And, ultimately, Charlotte makes an active and conscious decision to prioritize her own comfort over all else. Children younger than Charlotte died because of the 1830 Indian Removal Act (Trail of Tears); Charlotte decides she can’t even read about that, and Mrs. Newman comforts and her affirms her fragility in this moment. Read this again from the point of view of a Cherokee, Choctaw, Seminole, Creek, or Chickasaw child who has heard about the Trail of Tears since infancy. That child does not have the luxury of waiting until they’re older to understand the concept of genocide. How would Charlotte’s joke about the Trail of Tears, and her decision to wait to read the article until she can handle it better, land with that child? What about Charlotte’s, and Mrs. Newman’s, declaration that they don’t want to hate Laura Ingalls or the government forces that destroyed Native lives--how would a Native child, who feels rightful and understandable rage, feel upon reading those words? I’d feel minimized, gaslit, like my and my people’s concerns had been erased--for the billionth time. Gloria and Teresa also serve to further the Charlotte-as-suspect plotline; thanks to a misunderstanding, Charlotte yells at them, which lends credence to the theory that she was the vandal. Towards the end of the book, Charlotte realizes she needs to apologize to them. At the end of the day, Laura Ingalls Is Ruining My Life gives lip service to anti-racist and anti-colonialist advocates. Their arguments and voices are given minimal space in the book; Rose’s speech is great, but it’s three pages in a 296-page book. The book prioritizes White comfort and White fragility over justice and equity for Native people (who are never actually given a voice--no tribe is named, no Native individuals are referenced or quoted, and oh, how great would it have been for Charlotte and co. to delve deep into The Birchbark House series?). Characters like Gloria and Teresa who enact and perpetuate White supremacy are not held accountable, but are framed as overwhelmingly sympathetic--nice White ladies. And ultimately, according to Laura Ingalls Is Ruining My Life, while it’s important for everyone to understand the complexity of history, it’s equally important for White kids to wait until they feel up to the task of learning about other people’s trauma, and to not hate Laura Ingalls or her people. Indeed, the Author’s Note leads me to believe that Tougas is an unapologetic Ingalls fan--she recommends three biographies of Laura Ingalls Wilder, and alas, no books authored by Native people. Charlotte’s choice to read the essay or not--to include knowledge of the Trail of Tears in her consciousness, or wait until she’s ready to handle it--that choice is the essence of White privilege. We White people are getting better at making a show of anti-racism. Our methods are becoming more sophisticated. We acknowledge the anti-racist argument, provide it lip service and limited space, before snatching back control of the narrative and recentering our own comfort. Read Laura Ingalls Is Ruining My Life as the next step, the next generation, the next wave of racism. Watch closely, especially if you’re White; racism is evolving before our very eyes.